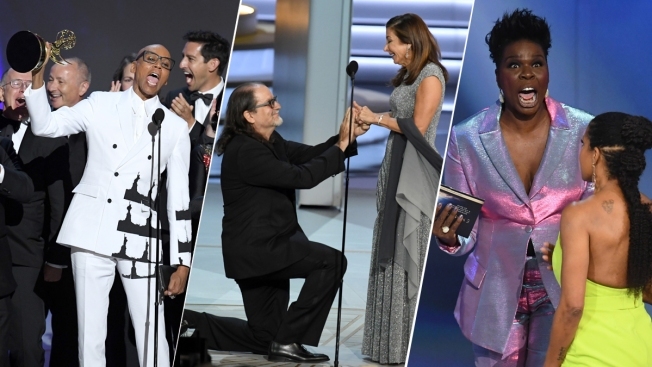 Jenifer Lewis stood with Nike in a metal-studded swoosh sweatshirt on the Emmys new gold carpet and Scarlett Johansson stunned as a goddess in white during the parade of fashion on TV's biggest night. RuPaul spoke with reporters in a white double-breasted suit by Calvin Klein, adorned with a few black Statues of Liberty. Issa Rae, meanwhile, wore a baby blue custom look from Vera Wang with a flowing, embellished plunging top and loose pants underneath. The look for Lewis, the "black-ish" actress, came after Nike faced backlash for featuring quarterback Colin Kaepernick as the company's new face. She wore a red-and-black sweat shirt with Nike emblazoned on it and the bedazzled swoosh. She accented her black leggings and black-and-white pattern boots with a diamond bracelet and ring. Lewis said she wore Nike "in support of Colin Kaepernick's protest against police brutality and racial injustice," referring to the quarterback's controversy after first taking a knee. "I want to speak to the millennials today to let them know they are not alone when they speak out," said the 61-year-old Lewis. "We are not living in dark times. We are living in awakening times, and I am proud to be one of the leaders in the movement." One of the evening's first stunners was worn by Angela Sarafyan of "Westworld." She smiled, posed in a black strapless ball gown and said it best: "Sparkles!" Trevor Noah, meanwhile, fended off a sticky star marking spots the carpet. One stuck to the bottom of a shoe, allowing him to show off his red soles. Johansson's look featured drop sleeves with a plunging neckline and high side slit. She posed with one of the evening's co-hosts, Colin Jost, her bob swept back. The actress accessorized with diamond chandelier earrings, her flower back tattoos on display. Tiffany Haddish was her own kind of goddess in a custom look by Prabal Gurung. She asked the designer to help her honor her father in the colors of the Eritrean flag and Gurung didn't disappoint with a look of bright vertical stripes of red, yellow, blue and green. She wore her hair in a high long ponytail.